Final, timber, time and inclination all at the same place at the same time. With considerable help from the estate chippy the frame of the shed and roof are on. This is the first image. 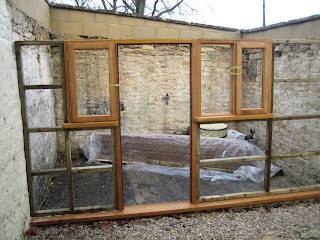 It has a hard wood sill, door and window frames with treated softwood stud work. The spacing of the stud is 400mm to fit the insulation and both windows are opening casements. It is more likely that I'll need summer ventilation than winter warmth. The frame is sitting on the sleeper wall and bedded on a generous helping of silicon. This will act as sealant, adhesive and DPC. The next stage was to clad the structure. T&G hardwood is glued and nailed. The timber has been treated with Sadolin three times to preserve the timber. Next, the roof. The quickest solution and most sustainable is corrugated iron on 6x3 treated soft wood. The metal s cut into the surrounding stone, filled with expanding foam and then a cement fillet around the edge. I now have a shed, not much more than was there before. Now to insulate, clad and put a floor in. After that comes the heating and lighting and furnishing. Only two months behind the original schedule, but this self build? 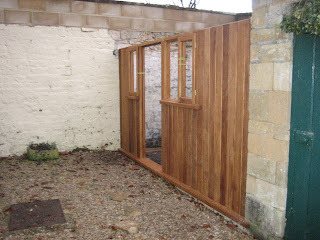 Been busy on the shed over the festive period, but will post gain and give a link to your site.